Sorrento is a tourist town on the southern Gulf of Naples. The distance from Naples is about 50 km. Sorrento is near the famous Amalfi Coast. The city is situated on a steep slope directly by the sea. It is famous for citrus products, especially lemons. Sorrento is connected with Naples via Pompeii by the narrow-gauge railway Circumvesuviana. It’s a beautiful city, ideal for a vacation. Many top attractions are easily accessible from Sorrento. These include Naples, Pompeii and Herculaneum, all by train. 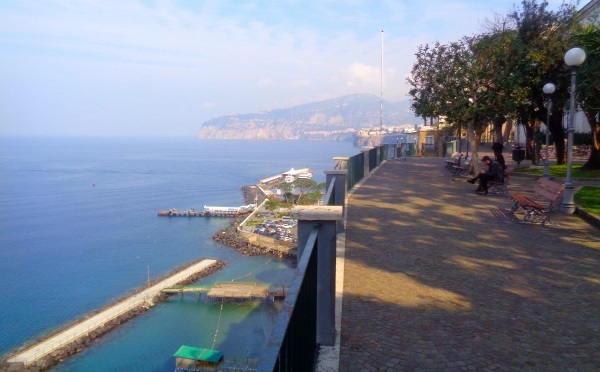 Almost every tourist in Sorrento, whether by rental car or bus, makes an excursion to the Amalfi Coast. In the beautiful city of Sorrento itself there are not many big sights. Popular among tourists is the small park Villa Comunale with southern plants like palm trees. Villa Comunale is famous for its view. The park is up in the city center, directly in front at the steep slope. 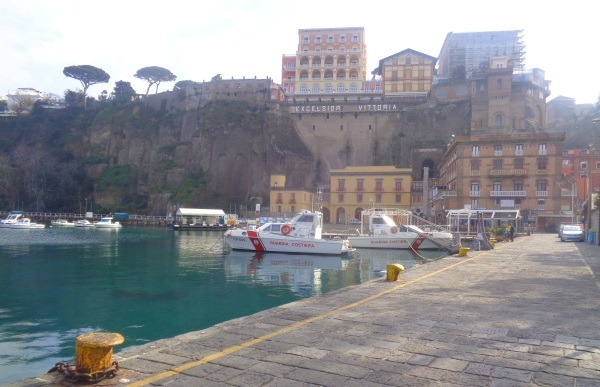 You have a great view of the sea, the port of Sorrento and ferries and other ships. Here is also the elevator for pedestrians down to the port. Sorrento and the Amalfi Coast are famous for citrus fruits, especially lemons. The lemons are much bigger here than here. All kinds of products are made from the fruits. 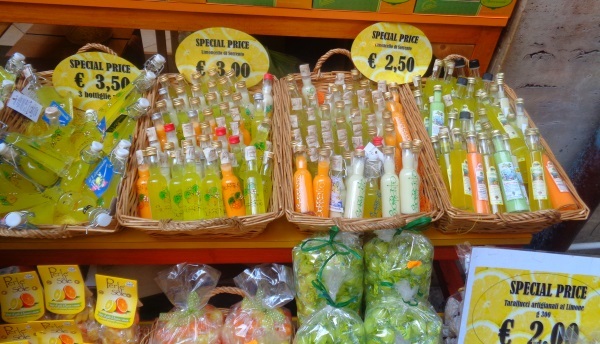 The most important product is limoncello, a liqueur made from lemons. Try it at all costs (see the small yellow bottles in the picture). 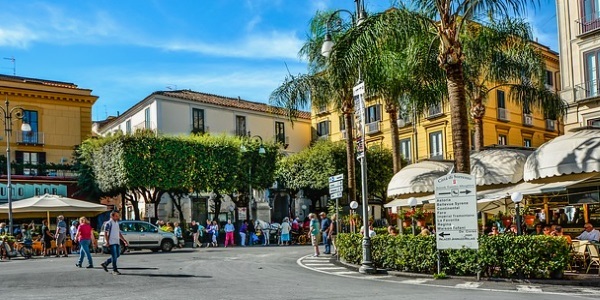 The ideal place to taste and buy Limoncello and other products made from lemons and oranges is „Limonoro Fabbrica“ in the central pedestrian area of Sorrento (Via S. Cesareo). Also the candy and the lemon chocolate from local production taste excellent in Sorrento. You should also try it. The locals in the Neapolitan language call their city „Surriento“ by the way. Tourism in Sorrento is hundreds of years old. For a long time the beautiful city in southern Italy has attracted artists and painters from colder European countries. The cathedral of Sorrento, a very old church from the Romanesque period, is certainly also a sightseeing. Also the museum „Correale di Terranova“ with works of art and furniture is worth a visit. By train from and to Naples: Sorrento has only one station for the local railway Circumvesuviana. The only route goes to Naples. There are about 2 trains per hour during the day. The train is very popular among tourists and locals, also because the prices are very low. By train from Sorrento to Pompeii: One of the many stations of the narrow-gauge railway Sorrento – Naples is Pompeii. If you get off there, you can visit the famous excavation of Pompeii. The main entrance of the excavation is directly opposite this railway station in Pompeii. In the museum in Naples there are rarely long queues, you can buy the tickets on the spot. By train from Sorrento to Herculaneum: The second major town, destroyed by the eruption of Vesuvius in 79 A.D., can also be easily reached by the Circumvesuviana railway from Sorrento. You go towards Naples and get off at the station „Ercolano Scavi“. „Ercolano“ is the Italian word for Herculaneum, „Scavi“ means excavation. So the station is simply translated as „Herculaneum excavation“. By bus to the Amalfi Coast: There is a bus every hour from Sorrento to Amalfi. Buses depart from the square in front of the Circumvesuviana train station. The bus to Amalfi takes about 100 minutes and costs, like the train, very little. A single ticket to Amalfi costs only 2.90 euros. The buses go via Positano. At the terminus in Amalfi there is a small bus station. There you can take another bus to Salerno. By rental car: Many tourists rent a car nowadays. The extremely narrow road along the Amalfi coast is legendary. It is not always easy to find a parking place everywhere, the parking fees are partly high. For the above mentioned destinations Naples, Pompeii and Herculaneum we recommend the train.